It isn’t immediately obvious, though, how liberation theology, in all its contemporary diversity, should be related to the Wesleyan theological tradition, which began with the rise of the Methodist movement in 18th century England. Are liberation and Wesleyan theologians kindred spirits? Or do the differing historical roots and concerns of these two movements raise difficulties for those who seek to bring them together? In No Religion but Social Religion, Joerg Rieger, along with Paulo Ayres Mattos, Helmut Renders, and José Carlos de Souza, reflect on this topic with true passion and helpful clarity. In their eyes, these two streams of theology have the potential to draw out the best in each other as they speak of God’s presence among those experiencing poverty in a world marked by both grace and persistent injustice (5-7). They also seek throughout the book to highlight Methodist voices around the world working out of the liberation tradition to demonstrate that liberation theology has roots beyond the world of Roman Catholicism. Part of the overarching argument made by this book’s writers is that the Wesleyan tradition and liberation theology share important instincts in common. Rieger notes that both “understand that God’s work has to be identified in the midst of the pressures of life, rather than on the mountaintops” (5). This conviction leads both streams of theology to look for God’s presence among those on the margins and at the bottom of society, rather than at the top in traditional centers of power (56-57). As I read this section of the book, it occurred to me that at a basic level Rieger and the other contributors are asserting that both Wesleyans and liberation thinkers should be able to nod together in assent to the perspective of the Catholic spiritual writer and Trappist monk, Thomas Merton, who I believe put it well when he once wrote, “We must never overlook the fact that the message of the Bible is above all a message preached to the poor, the burdened, the oppressed, the underprivileged” (Seeds, 110). From the perspective of Rieger and the other contributors, Wesleyan theology that draws on the works of liberation theologians is better able to take these words seriously and think about what their implications should be for the rest of Christian theology. Given the historical emphasis on the love of God and the empowering, transformative nature of grace in Methodist theology, relating liberation and Wesleyan perspectives together cannot fail to explore how these themes engage with the issues of God’s work in the world and social change. As Rieger himself rightly observes, some critique Wesleyans on this point for being excessively individualistic, thereby neglecting engagement with larger societal issues and leading to grudging acceptance of the status quo (39-40). It should be granted that this observation rings true for some parts of the Wesleyan tradition. Not all 19th century Methodists, for example, lived up to the abolitionist sentiments of John Wesley himself. In response to these criticisms, Rieger and the book’s other contributors work at highlighting resources within the Wesleyan tradition for developing a wider conception grace and sanctification (40). From their perspective, grace shouldn’t be examined in the abstract, separate from the concrete conditions of people’s lives (37-38). Rather, Rieger suggests that for Wesley grace is relational, having to do with “what Christ can do in the lives of human beings and their communities,” and it therefore must make a concrete difference on both the personal and social levels (39). As historians of Methodism like John R. Tyson have noted, one of the themes that distinguished the early Wesleyan movement was the importance given by the Wesley brothers to participation in spiritual disciplines as ways to encounter and be changed by the grace of God in daily life (The Way of the Wesleys, 134-135). These spiritual practices are also known as means of grace, and traditionally include both works of piety and works of mercy. In one of No Religion but Social Religion’s later essays, Rieger notes that in his perception of Wesleyan spirituality, these practices are meant to be intertwined in the Christian life, rather than sharply separated from each other as they sometimes are, with works of mercy potentially being considered less important. Both, he asserts, “are channels through which we invite and receive God’s grace into our lives, and through which we are empowered to follow God’s work in the world” (50). 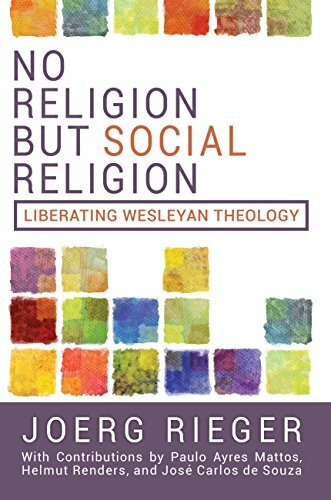 By giving a theological framework for seeing the theological significance of practices focused on struggling for justice and standing alongside the down-and-out in society, I think Rieger shows at least one way in which the Wesleyan expression of faith makes its own contribution to liberation theology. Granted that the focus of the book is on highlighting aspects of Wesleyan and liberation theology that are ripe for deepened engagement with each other, it’s understandable that they don’t spend more time discussing parts of the Wesleyan tradition that may potentially be called into question when explored from a liberationist perspective, but if they had devoted more time to engaging with critical voices, and mulling over the issues raised by them, I do think they would have made an even more significant contribution to the shape of the conversation. All of that being said, I think Rieger and the other contributors in No Religion but Social Religion paint a compelling picture with their essays, and it seems to me that they have their finger on something important for the future of both Wesleyan and liberation theology. I think we all would do well to give an attentive ear to what they have to say. *Disclosure: A copy of this book was provided by Wesley’s Foundery Books for review purposes. The opinions I have expressed are my own, and I was not required to write a positive review. This entry was posted in Book Reviews and tagged Book Reviews, Helmut Renders, Joerg Rieger, Jose Carlos de Souza, Liberation theology, Methodist theology, Paulo Ayres Mattos, theology, Thomas Merton, Wesleyan theology by joecrow91. Bookmark the permalink.